In times of geopolitical or economic uncertainty, people start to dress for the occasion. Whenever the world is teetering on the edge of Cold War 2, you can be pretty certain there will be camo prints at fashion week. If there’s going to be tanks rolling down New Bond Street, then you might as well look the part. The warcore trend is fashion’s angst-ridden response to rolling headlines about yellow vest protests, alt right violence and war games in the South China Sea. Like a special ops unit of streetwear, this menswear division sees recruits dressed head-to-toe in combat threads, and we’re not talking about long-welcomed military pieces like a bomber jacket. For SS19, it’s all about mid-layers that look like bomb vests. Balaclavas on the runway. Accessories that could just as easily carry spare rounds of ammunition as your keys and wallet. 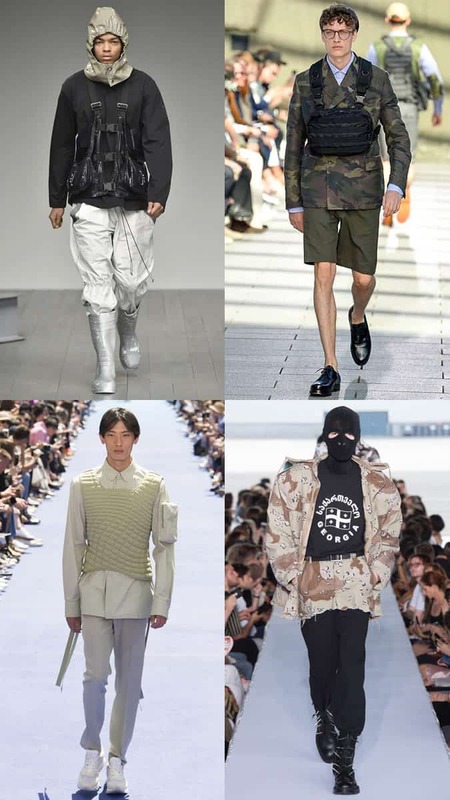 The correlation between conflict and fashion isn’t always exact (we didn’t all start dressing in faux-body armour as soon as the Harriers took off for Baghdad in 2003), but the influence of a society on the verge of violence often manifests in street style and catwalk fashion. The most famous (and of course, the most over-used) example of this relationship between style and discontent is the advent of punk – when a nation gripped by recession, politicised street violence, a three day week and a gravedigger’s strike came up with a tattered, bomb-site aesthetic that would go on to become one of the great touchstones for visual culture the world over. Some years later, long-standing army surplus store Laurence Corner became an unlikely mecca for trendy young Londoners looking for striking, but durable clobber to navigate a fractured city in. Leather coats, ribbed knit jumpers, combat fatigues, MA1 jackets and carefully placed rips and tears have hardly spent a season out of vogue since. Fashion usually reflects the world it’s born into, and that world hasn’t exactly been very sunny over the last 40 years. This may or may not explain the near-omnipresence of combat-inspired fashion in that time. It’s interesting to note that during the halcyon peacetime years of the late 90s, bead necklaces, belly tops and surf wear were all the rage. 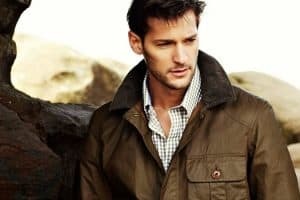 In the years since, the dominant look amongst young people shifted to something much more durable and lightweight; puffa jackets and tracksuits in dark colours, sometimes laden with superfluous straps. Clothes you could do a bank job in. Unfortunately, in the era of the Mail Online celebrity sidebar – the apex of this aesthetic is not a subcultural movement like punk, but Jaden Smith walking around L.A. wearing a bum-bag that looks like an artillery belt, whilst Vladimir Putin mulls over a full on assault on the Donbass. Oh well. You’ll see warcore it in all aspects of fashion; the high-street, streetwear and the proper high-end. You’ll find it in the fetching ‘Bogside chic’ of Rik Owens’ $500 luxury balaclava, in Off-White’s urban-camo pieces, Cottweiler’s desert combats (complete with what look like utility holsters), Heron Preston’s flak-jacket inspired vests and basically the entire oeuvre of Alyx – whose ‘weekend paintball marshall’ aesthetic is quickly being picked up by the fashion illuminati. It’s a look that very much says “I’m sitting next to Virgil and Kanye on the front row of the end of the world”. It doesn’t just stop at garments either. Streetwear brands have been offering collectable items for some time now, and cult label Antisocial Social Club’s branded riot shield is perhaps the most quintessential warcore accessory of all. When accessorised with the now-infamous ‘Supreme brick’, it’d make quite an outfit for the fashion conscious urban guerrilla. Who says you can’t be on trend when you’re getting tear gassed at an anti-fascist protest in Cologne? But perhaps we’re over-analysing the reasons behind this trend. There’s definitely something in the idea that the constant images of combat, protest and disaster beamed into our collective consciousness by Live Leak and Channel 4 News has influenced the way we dress – but maybe warcore is just a natural progression for a changing silhouette, one born through certain necessities in modern urban living. As our cities have become bigger, dirtier, hotter and colder – the way we dress has had to adapt. I noticed a few years back that I, and almost everyone I knew, were dressing evermore functionally. In my teen years I would think nothing of going out in a pair of brogues or winkle pickers, but as time had gone on, trainers and boots had become absolutely necessity for getting around. In general, you see fewer heels around these days, fewer men in suits, fewer dandyish affectations and thicker socks. Even jeans, which can be sweaty and immobile on crowded trains and close dancefloors are far less universal than they used to be. Tracksuit bottoms have become totally acceptable almost everywhere; offices, restaurants, awards ceremonies – whereas once upon a time you were seen as a thug for wearing them outside of the gym. Our silhouette has altered to something much more practical and breathable, and our world has changed into somewhere much more uncertain – fashion history dictates that it’s only natural that something like warcore would come along.